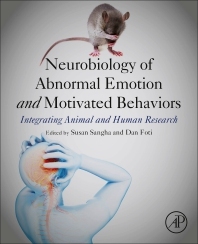 Neurobiology of Abnormal Emotion and Motivated Behaviors: Integrating Animal and Human Research pulls together world-renowned leaders from both animal and human research, providing a conceptual framework on how neuroscience can inform our understanding of emotion and motivation, while also outlining methodological commonalities between animal and human neuroscience research, with an emphasis on experimental design, physiological recording techniques and outcome measures. Typically, researchers investigating the neurobiology of emotions focus on either animal models or humans. This book brings the two disciplines together to share information and collaborate on future experimental techniques, physiological measures and clinical outcomes. Susan Sangha completed her PhD in neuroscience from the University of Calgary, Canada, in 2005 with funding from the Natural Sciences and Engineering Research Council of Canada and the Canadian Institutes of Health Research. She was a recipient of postdoctoral fellowship awards from the Natural Sciences and Engineering Research Council of Canada, the Alexander von Humboldt Foundation, and the Human Frontiers Science Program. Her research combines behavioral, pharmacological, and electrophysiological methods to investigate the neurobiological mechanisms underlying memory formation in animal models, with an emphasis on neural circuits of emotion. She is the author of more than 30 peer-reviewed articles and commentaries. Dan Foti received his undergraduate degree in biomechanical engineering from Harvard University and PhD in clinical psychology from Stony Brook University before completing his clinical internship at McLean Hospital. His research in humans uses methods from affective and cognitive neuroscience to study information-processing deficits in psychopathology, with a particular focus on mood and psychotic disorders. His research uses multimodal neuroimaging (event-related potentials, or ERPs; functional magnetic resonance imaging, or fMRI) to characterize neural activity involved in reward processing, emotion regulation, and cognition, and how deficits therein may be used to improve clinical judgments of diagnosis and prognosis. He was a recipient of an F-31 grant from the National Institute of Mental Health and a research training award from the Society for Psychophysiological Research. He has published widely, with more than 35 peer-reviewed articles to date in top clinical and neuroscience journals.